The Egyptians fear the mushrooming population of the enslaved Israelites. They command all the Israelite baby boys be thrown into the Nile River. However, one mother sees something special in her baby and hides him for several months. When she can conceal him no longer, she does indeed put him in the Nile River, but not before protecting him in a watertight basket. Then she strategically places the basket where he might be found by a compassionate person. Her daughter hides nearby to see what happens. When Pharaoh’s daughter comes to the river to bathe, she discovers the baby and wants to keep him. The girl offers to find a woman to nurse the baby; she then goes and gets her mom. Although the boy should have been killed, the Pharaoh’s daughter saves him and even pays his biological mother to care for him. When the baby is weaned, his mother gives him back to Pharaoh’s daughter—who names him Moses. This mother’s name is Jochebed and she has two other children, Aaron and Miriam. 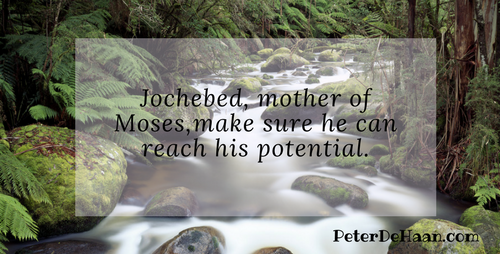 Jochebed, like many moms, sees promise in her child and takes extraordinary measures to make sure he can reach his potential. Love this story. Especially the part where the midwives who lied were blessed by God just like Rahab was. I love that He values lives over law.